This vintage, Moser, Czechoslovakia, Cut Crystal, & 800 Silver, decanter measures 13 inches in height to the top of the stopper. The total weight is 4 lbs. The silver hallmark on the neck of the decanter is a woman's head with kerchief with the number 3, silver fineness. The cut glass decander is signed on the base the Moser acid stamp. The success of Ludwig Moser, whose heritage has been developed since then, consists in the production of ecologically friendly lead-free crystal, of a unique color spectrum, specially designed by the most prestigious designers and in excellent hand manufacturing. 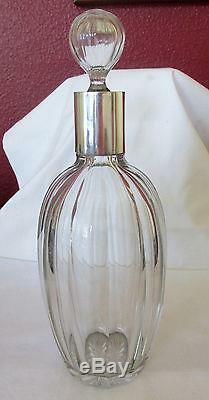 This rare crystal and silver decanter is in near pristine, great near antique condition. We believe the piece was never used to be in such extraordinary condition today. A massive piece of history. For the Moser collector or Czechoslovakian silver collector or someone who just wants quality focal point in any setting. Please read the entire description and review the photos carefully before making an offer. We make our very best effort to describe all pieces clearly and accurately. Many of our pieces are in "near pristine condition" and should not be confused with new. The majority of our items are antique or near antique. We take great effort in insuring our photos reflect the true look of our pieces. Showing as many views and identifying the condition of the piece. We will be happy to answer your questions. The item "Vintage Moser Czechoslovakian Cut Crystal & 800 Silver Decanter 1922-29" is in sale since Sunday, December 11, 2016. This item is in the category "Antiques\Decorative Arts\Glass\Decanters". The seller is "willsteff" and is located in New Port Richey, Florida. This item can be shipped worldwide.